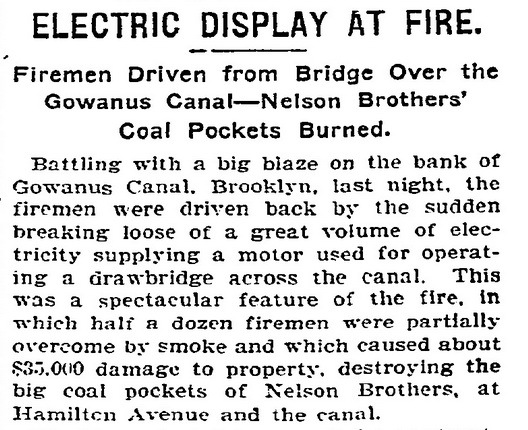 Battling with a big blaze on the bank of Gowanus Canal, Brooklyn, last night, the firemen were driven back by the sudden breaking loose of a great volume of electricity supplying a motor used for operating a drawbridge across the canal. This was a spectacular feature of the fire, in which half a dozen firemen were partially overcome by smoke and which caused about damage to property, destroying the big coal pockets of Nelson Brothers, at Hamilton Avenue and the canal...The pockets immediately adjoin the big draw-bridge over the canal at Hamilton Avenue. In a small frame structure beside the bridge was electrical machinery used for opening and closing the bridge. The wires were burned through and the machinery deranged. Then followed a display of electrical pyrotechnics which startled the neighborhood and drove the firemen back. Great sheets of white flame shot out in all directions and the freed electricity flashed along the ironwork of the bridge like streaks of lightning, causing the crowd looking on there to scatter in alarm. The woodwork of the bridge near the little shed caught fire, but the firemen could not get to the spot because of the electricity which filled the air...Two of the crew, armed with axes, made their way cautiously and chopped away the transforming apparatus and the wires about it, and cut off the current from the supply wires leading into the motor. The somewhat awe-inspiring electrical display then ceased, and the firemen put out the blaze on the bridge before it could do much damage...The fire caused a complete tie-up of traffic on the Hamilton Avenue trolley line at a time when travel from Hamilton Ferry was heaviest.